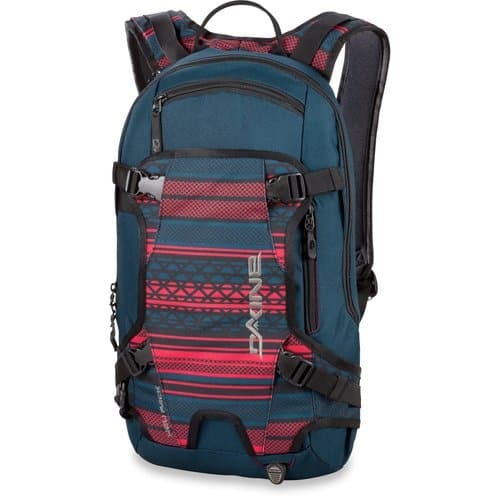 Whether you’re picking your way up a snow covered chute or battling across a rocky mountainside, you need a lightweight, comfortable and easily operated backpack to ensure success. After months of testing and extreme adventuring, I assure you that the Dakine Heli Pack proves durable, versatile and trustworthy for any day-trip adventure you have in mind. The Dakine Heli Pack is built for backcountry skiing and snowboarding and comes equipped with all of the essential features you need for your backcountry adventure. Moreover, many straps and compartments allow you to convert the backpack for your trekking, rafting or tourist expedition. 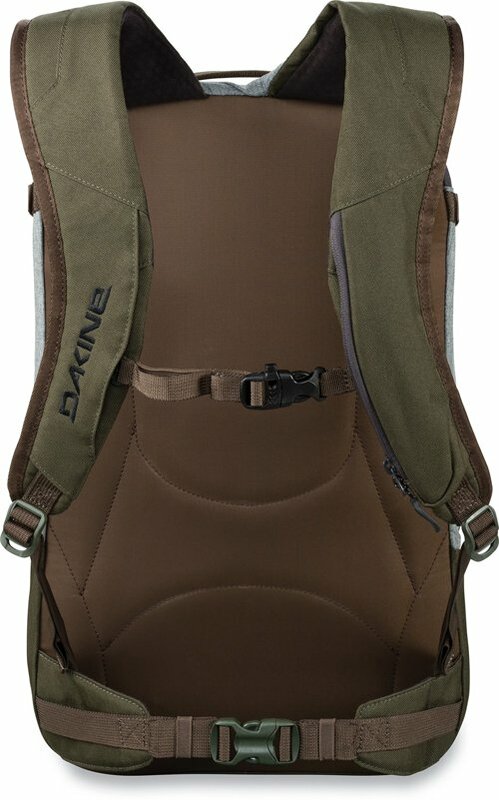 In six months of daily use, here is my take on the 11L Dakine Heli Pack. 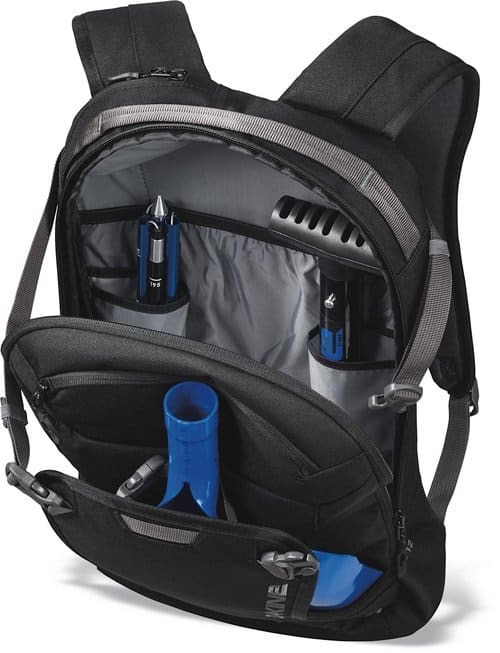 The Dakine Heli Pack has three designed storage spaces. The primary compartment fits the majority of your contents. Pack away food, a spare shirt, crampons, beacons, a camelback or whatever else your journey demands; however, take into consideration that 11L is not a huge space. Take your time packing and plan your content layout before stuffing your backpack full of equipment. Otherwise, space will quickly fill up and make it nearly impossible to successfully outfit your expedition. The second compartment is designed for smaller items. Specifically, goggles, as the area comes outfitted with a, felt lining to prevent any scratches or abrasions. This pouch is much smaller than the primary pocket and mainly serves for quick access items such as a phone, wallet, knife or pen. The one drawback of this pouch, and probably the backpack’s biggest downfall is that the more items it contains, the less area you have for storage in the primary space. This is because, by design, the smaller pouch expands back into the main pocket and thus robs it of its volume. Depending upon your quantity of equipment, you could lose up to two liters of space. I discovered that by packing the main pocket first, I could fit a few more items into the backpack, but still I encountered the same problem as before. The fact is the two pockets might have separate zippers, but they share much of the same space. The third storage area is an external pocket, formed by the backpack’s front template. This area is designed to hold a helmet but can double as a spot for loose clothing, poles, hats, etc. Considering the size of the backpack, this area becomes crucial for packing away large, clunky items like sweatshirts and jackets. Adjustable straps can widen and tighten the external pouch allowing for maximum capacity. Straps and synchs are the strong suits of the Dakine Heli Pack. For backcountry terrain purposes, the Dakine Heli Pack offers both a vertical carry snowboard option and a diagonal carry ski option. Snowboarders detach the front template straps from the backpack and wrap the ends around their lowest snowboard binding. Once in place, the straps connect and tighten to the board to offer a secure hold. Your snowboard might wiggle at first, so take an extra moment to tighten the straps down and restrict any unnecessary movement. I suggest attaching your board last as it can make packing and unpacking extremely difficult. But once firmly in place, you can rest assured that your snowboard will not budge no matter how hairy your ascent becomes. 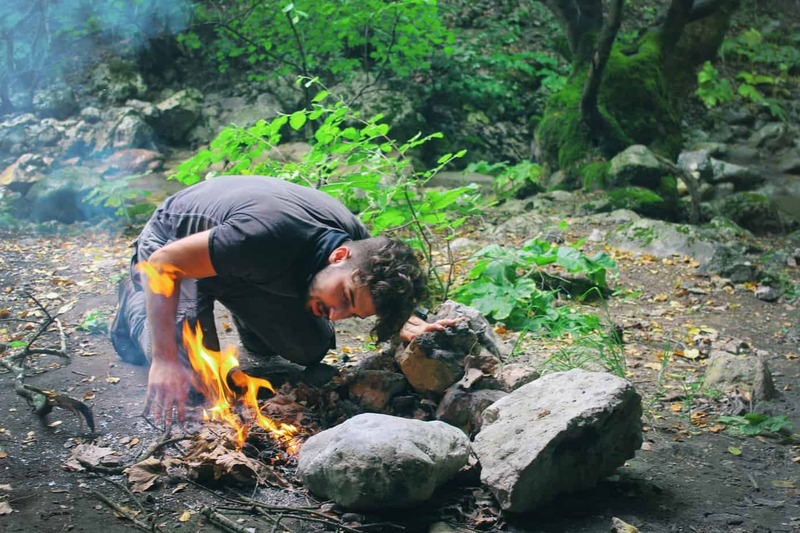 I have used it on several backcountry hikes and never once encountered any problems. Backcountry skiers use the lowest metallic synch and the highest plastic strap to position their skis. The straps wrap around each binding and tighten around the skis for a comfortable hold. Make sure before you set out on your hike that your bindings are safely in place as you don’t want your skis slipping out. Also, depending upon the weight of your skis, you might have to balance your backpack’s contents to offset the skis’ weight, but this can easily be completed within a few seconds. Another small plastic strap hidden beneath the backpack’s front template allows you to firmly and securely attach an ice ax, avalanche shovel or any other similarly shaped tool. For added security, a small built in the loop about halfway up the backpack ensures that whatever tool you use will not waiver or jostle around behind you. This small strap proved incredibly useful over the past few months. Never once did I feel my ice ax rattle around on my back. More impressively, even though the base of my snowboard and the tip of my ice ax remained only an inch or two apart, they never once collided. Each item remained firmly in place no matter how extreme the terrain became. The front template has one more strap hidden within the helmet storage area. This strap is used to store poles, but I found that it can also hold sunglasses or carabiners. Two more adjustable straps — a chest strap and a waist strap — further increase the backpack’s comfortability and security. These straps tighten to your body and ensure that no matter how steep or intense your decent/ascent is the backpack will stick to your body. Occasionally, the straps may seem annoying — especially if you’re casually walking throughout town with straps unconnected and dangling down — but when you’re using the backpack for its intended purposes, these straps prove the backpack’s greatest feature. Over several months, I’ve learned that each strap can function in more than one way. I’ve used the straps to hang snowboard boots, hats, wet clothes, sunglasses and anything else you can imagine. They add an extra layer of storage space to this backpack that the official descriptions do not denote. I’ve even used the straps to connect the Dakine Heli Pack to another larger, overnight backpack proving that the possibilities are endless. Within the primary compartment is a small aerated pocket designated for a filtration system. Your system of choice hangs from a black loop at the top of the backpack. The tube then weaves up the baseplate and down through the shoulder strap, allowing for quick and easy hydration. Being able to unzip my shoulder strap, drink from my camelback and continue on my way without stopping to repack has saved me heaps of time on the mountain. Plus, this design is exceptional as it keeps the water close to your body and thus prevents freezing temperatures. If you’re simply taking the backpack out to the library or a coffee shop, you can also use the internal, aerated pocket to store a small laptop or notebook safely. 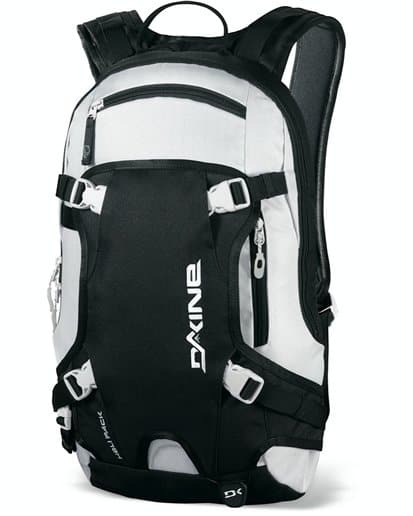 The Dakine Heli Pack’s shoulder straps and back plate are both aerated and padded making for a comfortable wear. The black padding does attract a fair amount of sunlight so that you might sweat more than usual, but with a dry fit T-shirt, you won’t notice out of the ordinary. The base plate padding is especially great if you’re using the backpack to store a laptop or tablet as it protects internal contents from any possible damage. 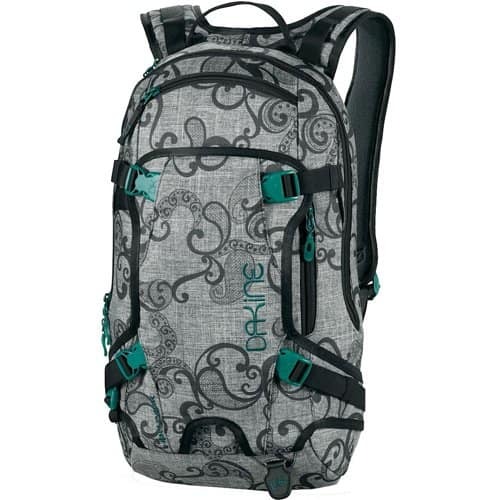 The 11L Dakine Heli Pack is a lightweight and versatile backpack that I recommend to everyone and anyone interested in outdoor activities. After almost five months of backcountry skiing, trekking and traveling, the Dakine Heli Pack has only suffered one slight crack in the waist strap. I do not recommend using this pack for an overnight trip as there is simply not enough space. However, if a day of extreme adventuring is in your wheelhouse, I suggest you take a look at the highly reliable Dakine Heli Pack.